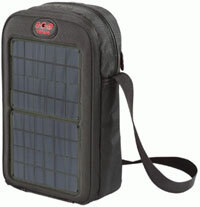 Voltaic Systems' Switch Solar Bag can charge a phone in four to five hours. A photovoltaic company has introduced a new line of portable solar chargers for handheld electronics. Voltaic Systems' $129 Switch Solar Bag is a travel bag with enough room, the company said, to hold a Kindle, a camera, and a phone, with room to spare. It weighs a little less than a pound and a half. Two 2 watt solar panels can charge a typical phone with four to five hours of sun exposure, the company said; one hour of sunshine can charge a phone for about three hours of talk time. When not in the sun, the battery can be charged using a USB power cable that comes with the bag or an add-on AC travel charger or DC car charger. The company's $99 Amp Solar Charger is a standalone charger that has room for carrying the adapters a user would need to charge devices. The $129 Fuse Solar Charger connects to a knapsack, bicycle, or other object to provide solar and battery power. Each of the units comes with an 11-watt hour lithium polymer battery pack designed to charge from solar and outfitted with an integrated USB port as well as nine standard adapters to connect the device that needs charging to the battery pack. The cases use waterproof, UV-resistant fabrics made from recycled soda bottles.